Ghost and spirits are the disembodied souls of dead persons that sometimes appear among living persons as vague, shadowy or evanescent forms. However, the existence of ghosts has never been proved using the scientific method. According to science, ghosts simply do not exist, and people who claim to have seen a ghost are mistaken, mentally unbalanced, or simply charlatans. What about those photographs and videos that have been taken of ghosts? Only reproducible results can be validated by the scientific method. 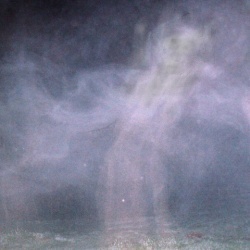 Ghost materializes from the mist. Science does not accept any individual picture as definitive proof because pictures or videos may be faked or the equipment may malfunction and produce images that can be misinterpreted. Many photographs of purported ghosts are taken with infrared cameras that are known to produce halos and other optical distortions. The thought of ghosts engenders irrational fear of the unknown. Since the dawn of man, during a dark night when wild creatures lurk nearby, spooky stories told around a campfire have had the power to give you goosebumps and send chills down your spine. There is a rich lore about ghosts that has produced numerous stories of sightings and hauntings, including such classical tales like "A Christmas Carol" by Charles Dickens and "The Legend of Sleepy Hollow" by Washington Irving. The King James Version of the Bible (Mark 15:37) uses the expression "to give up the ghost" to describe the moment when Jesus died. The expression implies belief in an afterlife where death is the point at which the soul (ghost) leaves the body. Many people believe in ghosts even though they may not exist or their existence cannot be proved. Ghosts don't have a material body; they are pure energy. Ghosts are not impeded by material barriers. They can fly through walls. Ghosts float around and are not subject to the laws of gravity. Ghosts are able to manifest themselves visually and selectively so that sometimes only one person can see them. Ghosts are never naked. They always wear clothes or are covered with sheets. Ghosts can possess and control a person, such as a medium, to convey their wishes. Ghosts may take possession of a living person, causing madness or bizarre behavior. A person possessed by an evil spirit or demon can be healed by casting out the demon through exorcism. Ghosts normally appear in the middle of the night. Ghosts are frequently encountered around cemeteries. Ghosts have the ability to move objects to make their presence known. Poltergeists are troublesome spirits or ghosts that cause disorder by moving inanimate objects, producing noises such as knocking, pounding, or banging, and launching physical attacks on human beings. The name "poltergeist" is derived from the German Polter ("rumble") + Geist ("spirit"). Tuyul or toyol is a spirit in the mythology of South-East Asia that includes Indonesia, Malaysia, Thailand, and Singapore. A tuyul is a small child spirit invoked by a shaman or witch doctor from a dead human foetus. A person who practices black magic can become rich using a tuyul to steal things from other people, but in exchange, the tuyul must breastfeed from a female family member, sucking blood instead of milk. A haunted house is a house or other building that is said to be inhabited by disembodied spirits of the deceased who may have been former residents or visitors to the property. Supernatural activity inside homes is said to be associated with violent or tragic events in the building's past such as murder, accidental death, suicide, or people who died with unfulfilled wishes. According to a 2005 Gallup poll, about one third of the people in the US, Canada, and the UK believe in haunted houses more than any other types of paranormal events. Psychic mediums are persons who claim to be able communicate with the spirits of dead people. They are usually clever charlatans who will take your money to tell you what you want to hear and make you dependent on their advice so that you will keep going back. There are people who actually believe that they have powers to perceive paranormal phenomena, but none have been able to demonstrate such powers when tested under controlled laboratory conditions. A séance is a meeting of people who gather to receive messages from ghosts or from spirits through a person who acts as a medium. Séances are usually held in dimly lit rooms illuminated by candlelight. The participants place their hands on a table and perceive the presence of the spirits by the movement of the table or other objects in the room. The practice was discredited in the 19th century by revelations that the mediums manipulated the objects using trickery and accomplices. Séances sometimes use ouija boards. Ghost hunters are paranormal investigators who investigate places that are reported to be haunted. An American paranormal reality television series called "Ghost Hunters" premiered in 2004. The investigators use various types of electronic equipment which they believe can detect paranormal activity. To lend credibility to their investigations, the team tries to look for reasonable explanations for things such as "cold spots", "strange noises", "moving objects", and "phantom lights". Friendly ghosts. Casper is a cute ghost-child cartoon with a New York accent, who prefers making friends with people instead of scaring them. 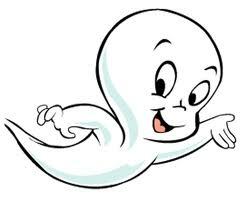 Casper was created in the late 1930s by Seymour Reit and Joe Oriolo, the former devising the idea for the character and the latter providing illustrations. 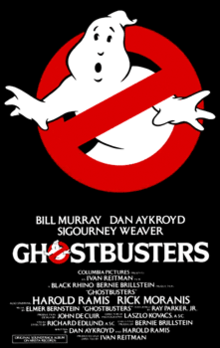 Ghostbusters , is a 1984 American comedy film about three eccentric New York City parapsychologists who investigate hauntings and try to capture ghosts. The script was written by co-stars Dan Aykroyd and Harold Ramis. The Holy Ghost or Holy Spirit is the third person of the Holy Trinity: Father, Son, and Holy Spirit. The term "Holy Ghost" was used in the King James Version of the Bible and was the common name for the Holy Spirit in English before the 20th century. 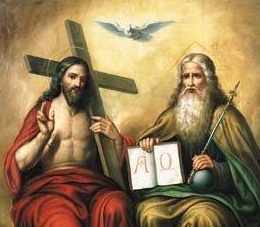 As one of the three persons of the Trinity, the Holy Ghost (Holy Spirit) is understood to be equal with God the Father (Jehovah), and God the Son (Jesus Christ). Christian art often depicts the Holy Spirit as a dove. Exorcism is the religious practice of evicting demons or other spiritual entities from a person or place which they are believed to have possessed. 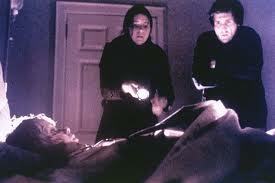 Exorcism is an elaborate ritual in which an exorcist commands the evil spirit to depart in the name of a higher power. The ritual may involve reciting prayers and using amulets or sacred relics that counteract the evil force of the spirit. In the belief system of many cultures and religions, ghosts are traditionally blamed for some illnesses. To cure them, a shaman burns incense, recites incantations, and may sacrifice a domestic animal to appease the ghost. The Exorcist is a 1973 American horror film directed by William Friedkin, adapted from the 1971 novel by William Peter Blatty. It is based on the exorcism case of Robbie Mannheim which deals with the demonic possession of a young girl and her mother's desperate attempts to win back her daughter through an exorcism conducted by two priests. Linda Blair plays the part of the possessed child. The investigators conclude that the girl is under demonic possession only after exhausting psychological and scientific medical explanations. 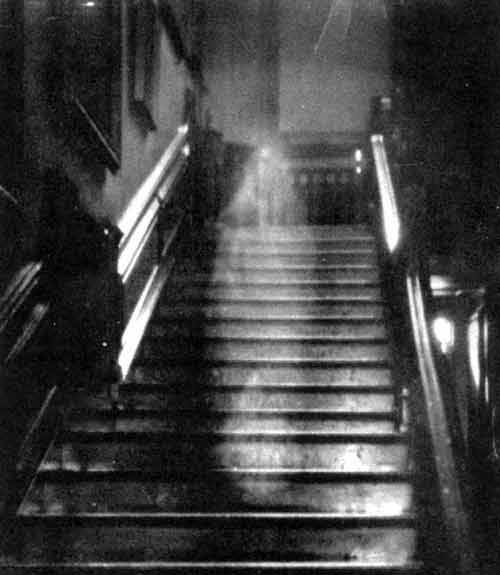 The Brown Lady of Raynham Hall in Norfolk, England. The photo was taken in September, 1936 by Captain Provand and Indre Shira, two photographers who were assigned to photograph Raynham Hall for Country Life magazine. The blurry spot in the photograph is thought to be the ghost of Lady Dorothy Townshend who died in 1726, but it could also be a defect in the film or an artifact of the development process. Several sightings of the lady were reported in the 1800s within the Raynham Hall mansion.